A great party and more tales from Governors Harbour. So this week there is lots to tell you about a great party in Governors Harbour, a car upside down in the harbour, news on Jack’s Bay and a brilliant craft company in Kenya ! 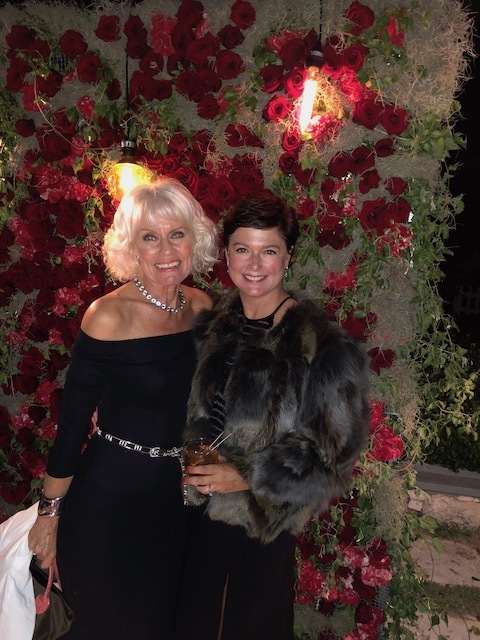 First the party – it was Angelika Bacchus’s 50th and boy does she know how to throw a party ! Here in her own words is Angelika’s vision of how the party should be…. 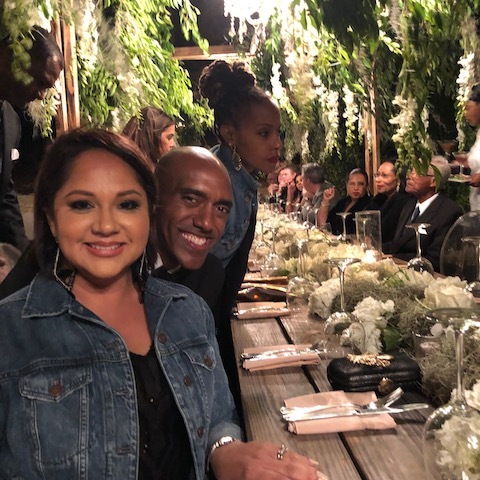 ” My inspiration – Chanel – but of course …… I wanted an enchanted garden on the beach with everyone dressed in gowns and tuxedos because how ridiculous would that be ! Spanish moss, orchids, roses and chandeliers on the beach ! I wanted a jazz band and I got Supercurl … And I wanted Cirque Du Soleil ” – more of which later …..
Angelika and Bob dressed to the nines ! So the setting was the grounds of Lush Life – the Taglich House on Banks Road – the whole affair was staged by Mish and Zev from Boy Meets Girl Weddings – Eleuthera – it was sensational. Everything was so beautifully styled and staged – if you want to have an event in Eleuthera then these are the people ! 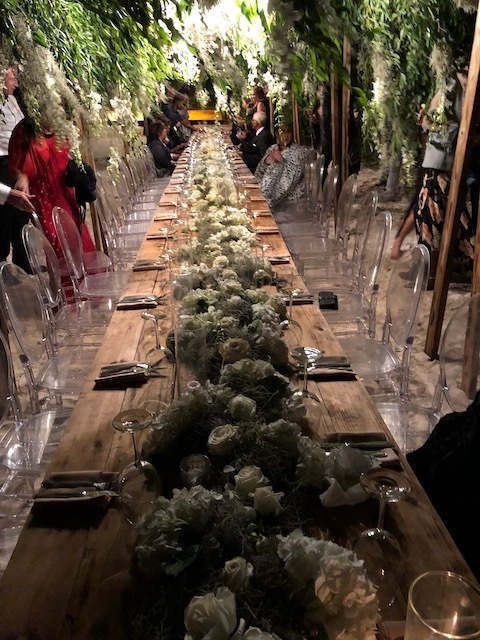 The table looked stunning and instead of Cirque Du Soleil performing we had Mish take a graceful balletic sashay down along the table between courses – she did not so much as knock over a single glass or trample the flowers – it was a treat to see ! Not a foot out of place ! 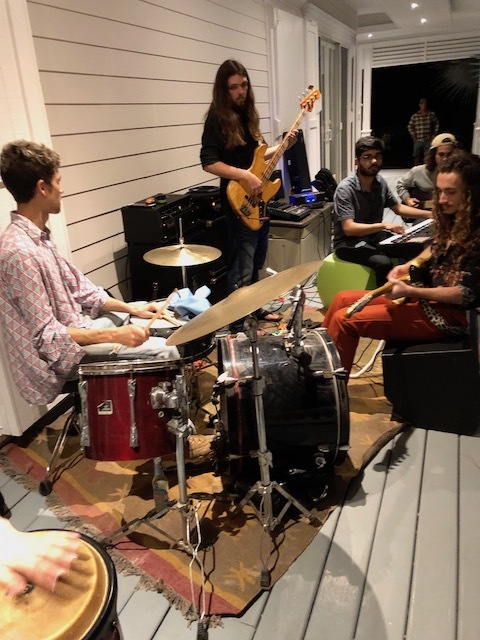 The band Supercurl are from Berklee College of Music and of course included Yanni – Angelika’s son who is studying there. They were brilliant – they played for 2 hours while the 50 plus guests all sipped champagne around the pool and nibbled on tasty appetizers – while at the same time posing for photos in front of the flower wall – studded with red roses. This was a great touch and so impressive that nobody could resist posing in front to it for a few shots….. 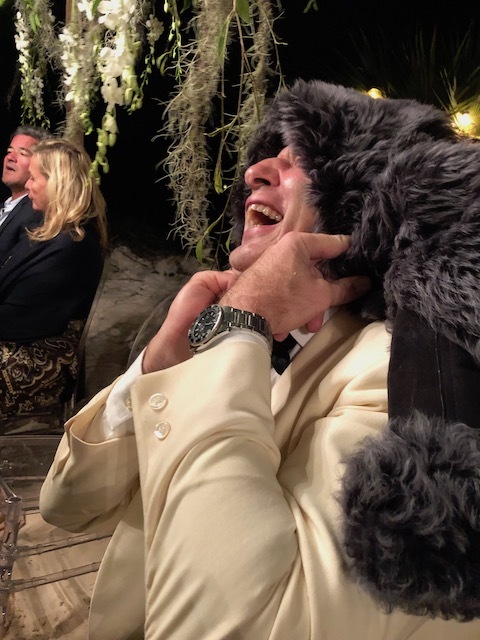 The night was pretty cool and breezy so when we all sat down for dinner I was very pleased with myself for having put a short little sheepskin jacket in the car. By now it was around my shoulders…. Mike Taglich wearing my jacket on his head !! 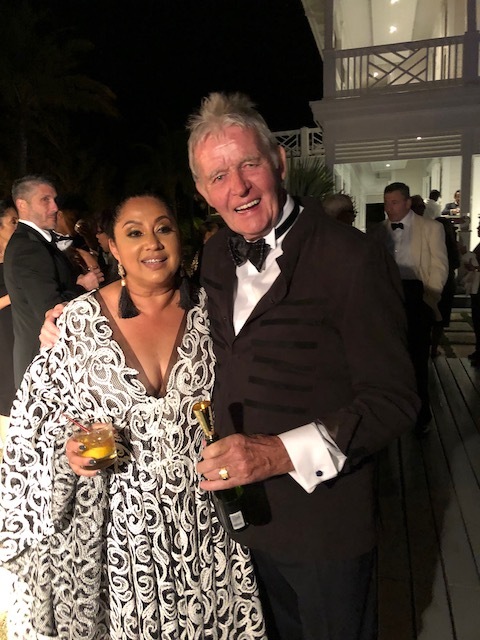 Angelika had a sensational dress specially made for the occasion by Rex fabrics in Miami – it took 3 months to make but was an absolute showstopper. Everyone really dressed up for the occasion and it was a joy to have such a special reason to glam up ! The men looked great in tuxedos and the women’s dresses looked fabulous. Bob and I left a little after 12 – tired and jet lagged – but the party carried on until around 4am with Supercurl really letting it rip ! So huge thanks to Angelika for having decided to celebrate her birthday with such style and inviting us all to such a night to remember….. Oh yes – there was Junkanoo between courses of the meal as well….. Of course it took us several days to recover but it was so worth it ! They were so good ….. 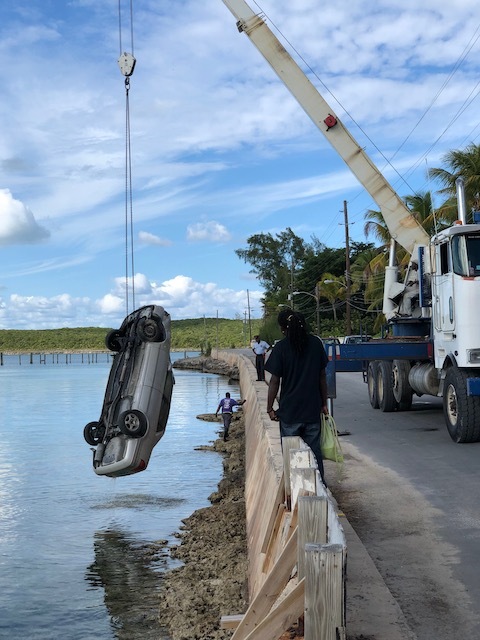 Excitement of a very different kind when on Friday morning last week a car ran off the road in Governors Harbour – flipped and landed on it’s roof …. Fortunately the driver walked away without a scratch – don’t ask me how. 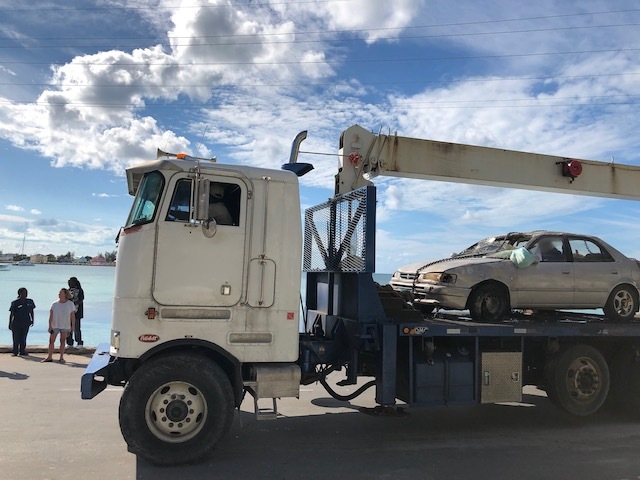 Jason Thompson came out with his crane and took only 20 minutes from start to finish to hook the car out , turn it up the right way and load on the truck. A brilliant bit of work …..
Lastly I want to tell you about a great set up called The Kenyan Crafts Company. 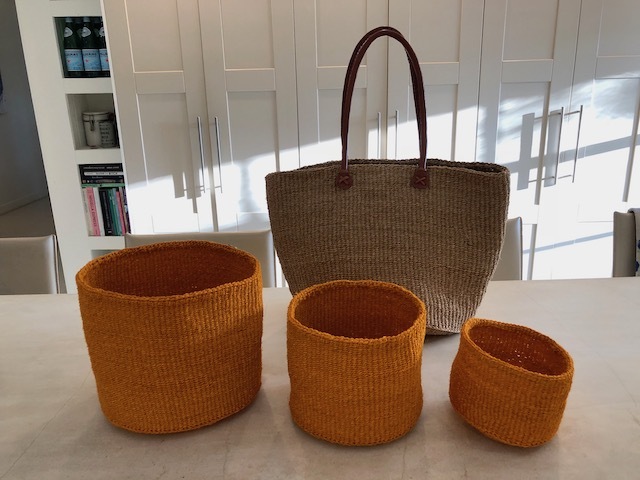 When we were in London, Bob’s daughter gave me a lovely shoulder bag and a set of 3 baskets all made in Kenya by a group of Kenyan women using a weaving tradition called Kiondo. Zippy is the remarkable native Kenyan woman living n London who has made this a successful company. It continues the tradition of local weaving techniques as well as providing a self help group of women with a source of income. And this is the final final bit ! 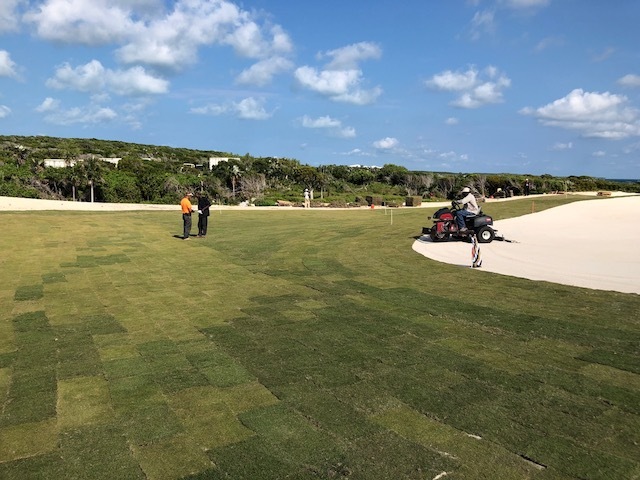 They are laying the sod on the golf course at Jack’s Bay and it looks really good. More up to date pictures next week I hope of further progress ….. Restaurant in the distance …. OMG, what a perfectly orchestrated GALA event for 50 years! Way to go Angelika…Always a time for celebration first class. Everyone look grand. 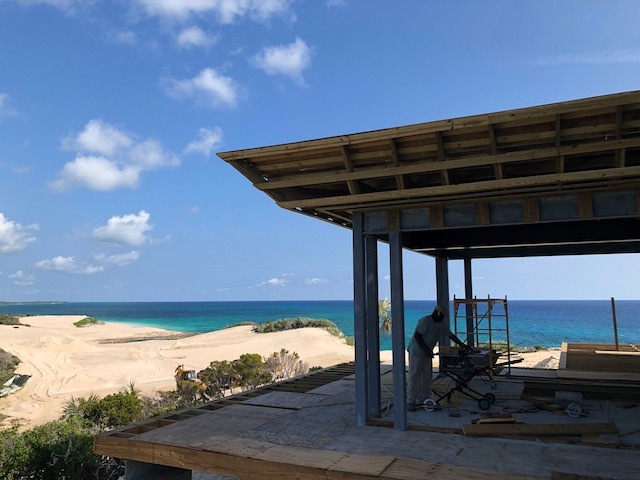 Beatles: “How does it feel to be one of the beautiful people?” :-) Nice progress at Jack’s Bay. 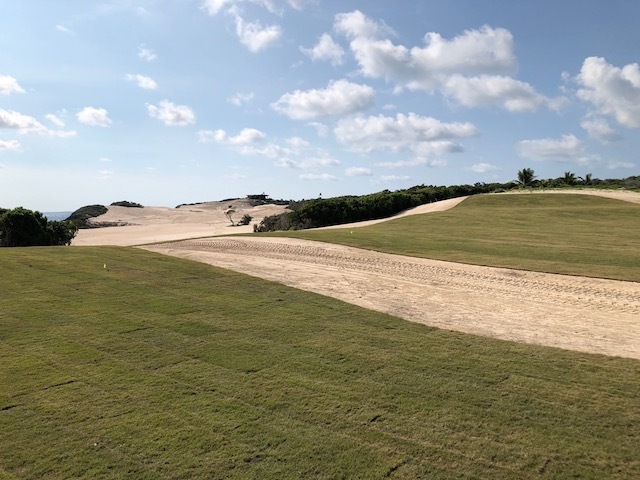 Great blog this week! Thanks for keeping us updated! Always lovely to know that you still read it ! Kindest regards to all….. 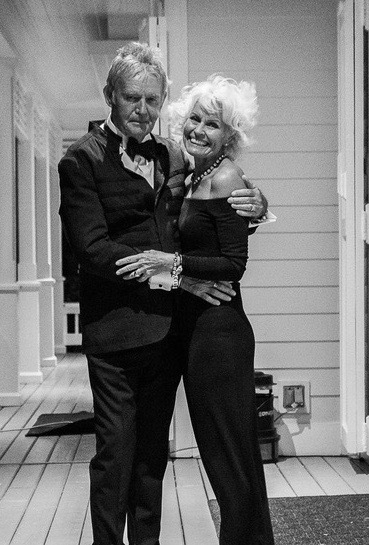 Happy New Year …..
Good Lord, Angelika Bacchus turned 50? I can remember when she was just a shy little girl with her hair in braids and several grades behind me at Windermere High School! I can also remember my family and I receiving treatment from her father, Dr. Bacchus, for many years when we lived on Eleuthera. 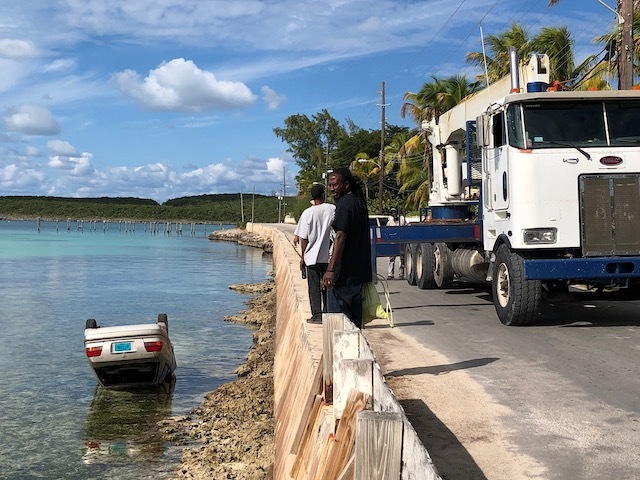 I haven’t been back home to Eleuthera in many years so I really enjoy this blog and all the updates! Thanks! I must tell her – she will laugh I know ! Glad you enjoy the blog …..